There's a road in Putney that always makes me laugh, thinking of a certain science fiction writer who also happens to be a mystery solving priest. Walking back from an excellent southern Indian meal on the Lower Richmond Road with marypcb, autopope and feorag I finally took an iPhone photograph of the sign for Fanthorpe Road. 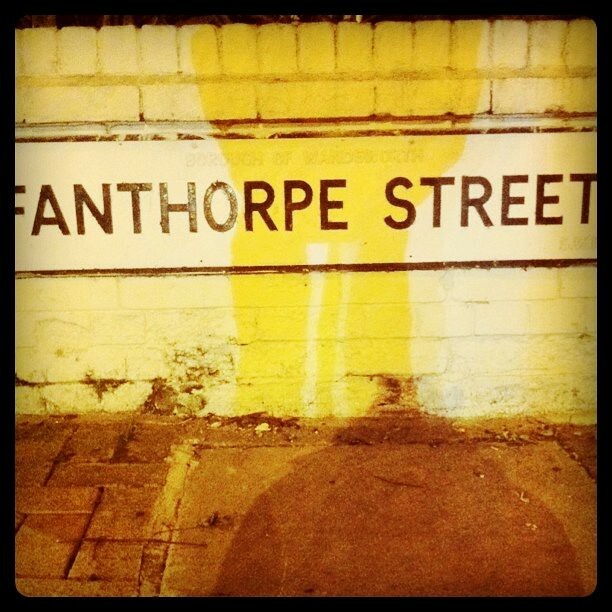 Or should that be (after a visit to Thesaurus.com) Fanthorpe Artery, avenue, back alley, boulevard, byway, court, dead end, drag, drive, highway, lane, parkway, passage, pavement, place, road, roadway, route, row, stroll, terrace, thoroughfare, track, trail, turf, way? It needs a model train set!